Proper cleaning of medical instruments before reuse is critical in order to reduce the incidence of surgical site infections (SSI’s) and healthcare-associated infections (HAI’s). Four critical factors (enzymatic detergent concentration/activity, wash cycle time, wash cycle temperature, and mechanical action) influence effectiveness of all cleaning processes and are essential for proper cleaning of medical instruments. A deficiency with any of these key factors may cause inadequate cleaning of medical instruments. Verification tests for washer disinfector validation and ultrasonic cleaners must respond to all 4 of these critical factors to adequately verify the entire cleaning process. Regular medical device cleaning validation is an integral component of quality assurance programs for hospitals and surgery centers. Regular testing verifies that the equipment is functioning properly, identifies any potential deficiencies, and decreases the risk of surgical site infections. The Association for the Advancement of Medical Instrumentation (AAMI ST79:2017) currently recommends testing mechanical cleaning equipment daily and after any major repairs. AAMI also states that “Effective cleaning is a multistep process that relies on several interdependent factors: the quality of the water; the quality, concentration, and type of detergent or enzymatic cleaner; the washing method… the time and temperature parameters and load capacity of the equipment; and operator and equipment performance.1” These guidelines are supported by AORN and other organizations. Used for both washer-disinfector validation AND as an ultrasonic cleaner test. Responds to all 4 cleaning parameters (enzymatic detergent concentration and activity, wash cycle time, temperature and mechanical action. Easy to interpret pass/fail results. Can be saved as a record of your medical device cleaning validation program. Cost-effective to support current DAILY testing guidelines. See recent publication by Dr. Michele Alfa comparing results of washer disinfector validation products tested under a variety of conditions. The Serim PINNACLE™ Manual Enzymatic Cleaning Process (MEC) is the only test available for cleaning verification of manual cleaning solutions using enzymatic detergents. This test ensures that manual bath solutions are properly mixed and contain active enzymes. Is the only test available for this purpose. Offers quick results (90 seconds). Ensures proper dilution and temperature of manual cleaning solutions using enzymatic detergents. Provides a visual indication that the enzymatic detergent needs changed. May be used as a diagnostic tool for expired or degraded enzymatic detergent. Water quality is also an important consideration for medical device reprocessing. Poor quality water can affect the sterility and functionality of surgical instruments as well as the performance and efficiency of mechanical washer-disinfectors. AAMI’s Technical Information Report, TIR34:2007 Water for the Reprocessing of Medical Devices states that, “Where applicable, monitoring procedures should be established to ensure the treated water is of adequate quality for medical device reprocessing.2” The report recommends that healthcare facilities monitor their water’s pH, hardness, and other factors. 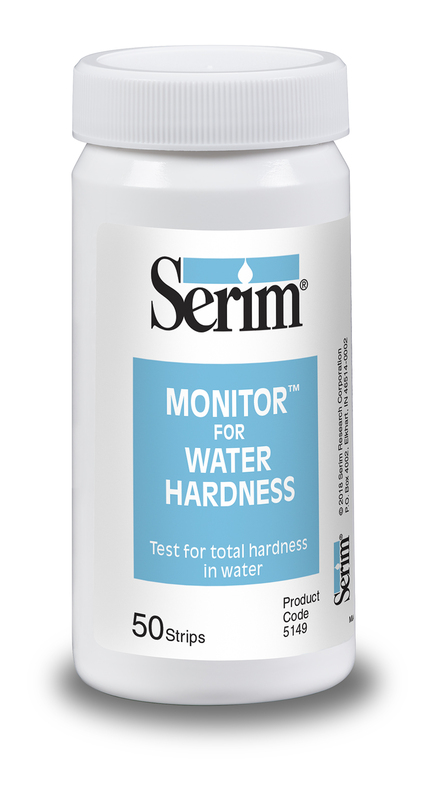 For over two decades Serim has been developing and manufacturing test strips that accurately measure water quality and disinfectants levels. 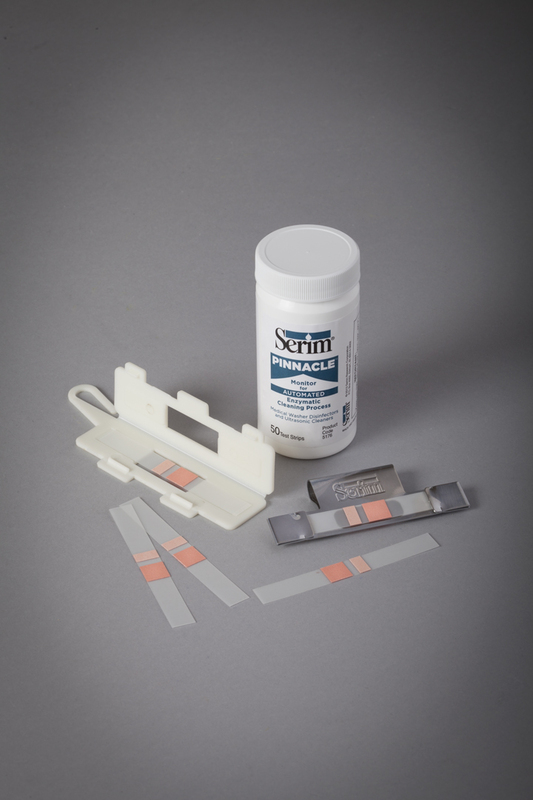 Our strips are used in thousands of medical facilities worldwide.